These institutions will develop "Green Teams," adopt energy efficiency, participate in a green bulk purchasing program, practice conservation, and use renewable energy to protect the environment and improve their bottom line. 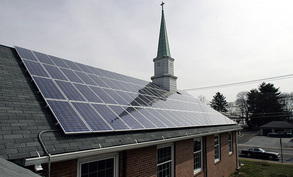 For 2,000 religious institutions, a reduction in energy use and costs by 25% would save a total of $3,257,328 and reduce CO2 emissions by 32,573 tons, the equivalent of planting 9,121 acres of trees (US Department of Energy). The Green Sanctuaries program ultimately motivates hundreds of thousands of faith institutions’ members to implement sustainable practices in their homes and businesses. Currently, the Clinton Global Initiative is a partner in securing a three year commitment for this program.